Home → Blog → My Zip-Line Lesson: You Might as Well Let Go! My Zip-Line Lesson: You Might as Well Let Go! Robert and I had a wonderful Vail and Santa Fe vacation. Our most memorable activity was our first ever zip-line experience. 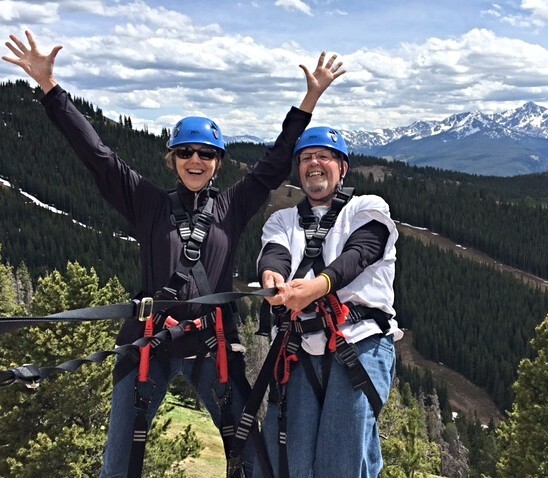 While in Vail and Robert had the idea to try zip-lining. I was shocked at this suggestion as he is afraid of heights and does not have great balance. I went along with this, hoping he would change his mind. The control freak in me was not thrilled with his suggestion. My husband feeling was- if not now, when? 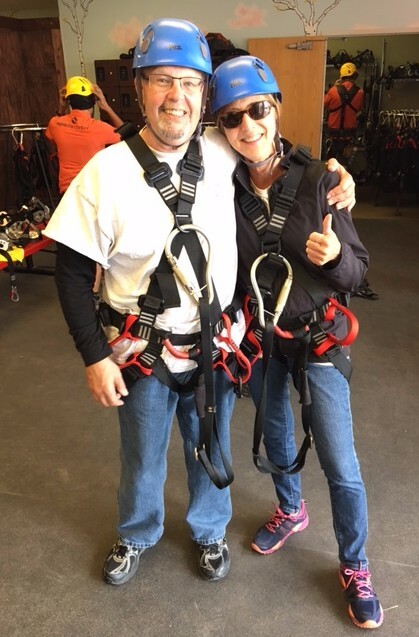 We went to the adventure center (the word adventure was my clue for what was about to take place), and the only zip that was open was the extensive 7 zip excursion. Yes, zip to zip to zip, with platforms and ski lifts in between. Well it was a go-big or go-home decision. No turning back after the first zip. We suited up, walked up the first log ladder and stood there, ready and scared. We were told to sit back in the harness and allow it to hold us. Okay, here we go- I went first after one of our guides. To my surprise I enjoyed myself but held on for dear life. Robert was next to go and he white knuckled it the entire way. After the first zip, I let go, sat back and enjoyed the exquisite landscape, figuring if the line snapped I would be dead whether I held on tight or let go- so why not go for it? Robert continued to hold on tight enjoying the experience. By the last two zips, I had totally let go, holding my arms out and screaming in delight. I appreciated the joy and freedom that came with letting go and fully surrendering to the experience. I also realized how much I love excitement and fun, and in my daily life and do not get enough of it. What is the point in this experience? Change things up, enjoy my day, and most of all to stop the “shoulds” and pressures I put on myself about money and judgment of my productivity. I want to simply embrace and enjoy what I do, plain and simple. With this said, in my Custom Calm work, I will still speak and offer programs. Keeping with my theme of challenging myself and having fun, I am joining forces part-time with a colleague to be her Community Connections Manager. In a nutshell, I will be doing the activities I love doing: Promoting, networking, speaking, connecting, writing for a 1-doctor dental practice whose work is in line with mine- health centered with a customized approach (yes your mouth is part of your body!) This practice works with many patients with chronic illness- one of my specialties as well. You will be hearing more about Dr. Brenda Paulen of Proud Smiles soon. It’s a funny story how I came upon this opportunity. I will save this for my next newsletter..
Summer is the perfect time to let go a bit more, have fun, and do what you love. Try something that makes you a bit nervous and push your limits. It is quite freeing. My zip line experience taught me that holding on tight only brings tension- if I’m going to crash, at least I want to enjoy the ride! I would love to hear about your new experiences.